MagTraps are North America's popular brand of magnetic separators for liquids, slurries, and pumped chunky products. These powerful magnetic line traps are available in more than 30 off-the-shelf models and an unlimited number of custom configurations when manufactured to customer specifications. Metal trash and fines, including work-hardened stainless steel as small as 0.0001 inches are captured by powerful, rare earth, neodymium magnets and held in-place until cleaned. 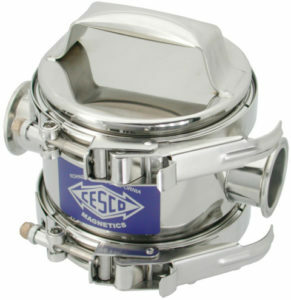 Powered by proprietary, easy to clean, tube or plate circuits that operate to pressures of 750 PSI and temperatures of 500⁰ F.
These magnetic separators are typically used when processing beverages and juices, batters, chopped foods, custards, pulped fruits and vegetables, jellies, minced meats, sauces and soups, syrups, and other products where they are placed in front of pumps, screens, or mills to protect equipment from damage, or in front of fillers to ensure product quality.